As the gastronomic world continues to mourn the closing of Ferran Adrià’s celebrated Catalan three-Michelin-star restaurant, which served its last meal in July of last year, its legacy lives on and now the founder has announced the sale of the restaurant’s extensive wine collection to further fund his El Bulli Foundation, the spiritual successor to the famed restaurant. 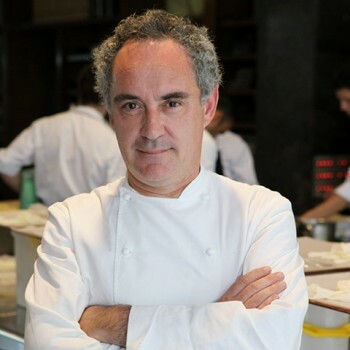 Founded over 50 years ago, El Bulli has been led by Adrià for the last 27 years. Since closing, Adrià has dedicated himself to transforming it into El Bulli Foundation, an experimental centre looking at the process of innovation and creativity. On 3 April 2013 in Hong Kong, and again on 26 April 2013 in New York, Sotheby’s will offer wines from restaurant’s extensive cellar. A total of 8,807 bottles, with an estimate of HK$8.6 – 12.5 million / US$1.1 -1.6 million (GB£688,000 – 999,500) will go on sale to benefit the new centre of gastronomic innovation. “The El Bulli cellar comprises an exceptional and unique collection of wines, that was created and developed by Juli Soler and the elBulli sommelier team [Agustí Peris, Eloi Sànchez, Isabelle Brunet, Lucas Payà, David Seijas and Ferran Centelles],” said Adrià. Highlights of the two sales include over 2,000 bottles of Spanish wine estimated at over HK$1.6 – 2.3 million / US$200,000 – $300,000 (GB£128,000 – 184,000), including nearly 100 bottles and six different vintages of Vega Sicilia “Unico” from 1987 to 1996, seven different vintages of Vega Sicilia Valbuena from 1995 -2002 and nine different vintages in 157 bottles of Pingus. All five First Growths are present in multiple vintages highlighted by full cases of bottles and magnums of Château Latour 2005, and over 124 Bottles of Domaine Romanée Conti (DRC), including seven vintages of Echézeaux, will also be sold. “Those of us lucky enough to have dined at El Bulli will never forget the extraordinary sensations laid before us,” Serena Sutcliffe M.W., Head of the International Wine Department at Sotheby’s, said.